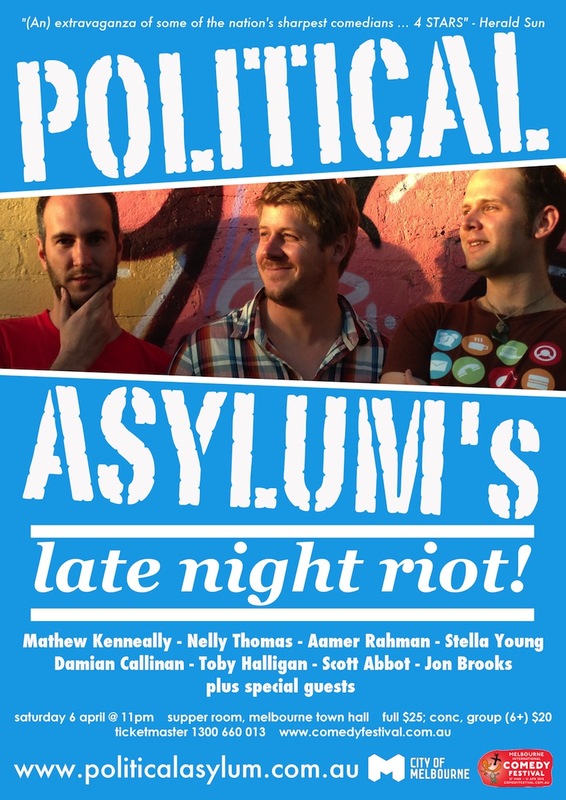 Political Asylum is a monthly line-up of great local political comedians. During the Melbourne International Comedy Festival they take up residence in Town Hall for one night only in their annual Late Night Riot. The late night show played to a packed auditorium and it wasn’t hard to see why. Every single performer on the line-up was fantastic. Political Asylum regulars Aamer Rahman, Stella Young, Toby Halligan, Scott Abbot and John Brooks were all hilarious, covering topics from Abbott and Gillard to compulsory horse-riding classes for the disabled. Mathew Kenneally was an absolute standout among the regular crew. He’s quick-witted, his material is incredibly strong and he did a great job of hosting the show. Nelly Thomas and Damien Callinan were special guests for the evening. Thomas amused with tales of remaining diplomatic while hosting talkback on Radio National. Callinan brought a touch of theatre to the proceedings, performing a meeting of the Horsham branch of Amnesty International. His characters were spot-on and painfully funny – his portrayal of a truly woeful ‘green poet’ was my highlight of the night. The extra special surprise guest for the evening was the wonderful Rich Hall. His material wasn’t quite as politically-minded, but the audience absolutely loved him, cheering for him to stay on after his red ‘get off the stage’ light came on. Hall’s droll observations of Australia had people in stitches. His comparison of our coalition government to the store that does shoe repair and key cutting was particularly funny for its strange accuracy. If Late Night Riot is any indication of the quality of the regular show in Brunswick, it deserves a packed house every month. These guys are serving up some of the most on-point and entertaining political humor around. The Run for the festival is over but Political Asylum is on at the Brunswick Green the second Sunday of every month.